This workshop will bring together scientists from the statistics, applied mathematics, signal processing and machine learning communities around the topic of convex analysis and its application to challenging inverse problems. The workshop will feature invited talks by world-leading experts presenting cutting edge research on new theory, methodology, and computer algorithms. We aim to provide a valuable opportunity to network and to foster extensive future interaction between the these disciplines. Here is the PROGRAMME for the day. Participants are encouraged to bring posters and should indicate on the registration form that they will be bringing a poster. Participants that do not indicate in advance that they will be bringing a poster will only be permitted to display it if there is space. The registration fee for the workshop is £35. The registration fee includes access to the workshop, refreshments including a buffet lunch. The workshop is subsidized by the SuSTaIn initiative. Limited financial assistance will be available to graduate students and early career researchers. This will be available on a first-come first-served basis and can cover travel and subsistence (but not registration). Please email the organizers to check availability. Some funds will also be reserved for partial assistance with childcare costs. More details will be announced in due course. The workshop will be held at the headquarters of the Royal Statistical Society in London. The location of the Royal Statistical Society and instructions on how to get there can be found here. 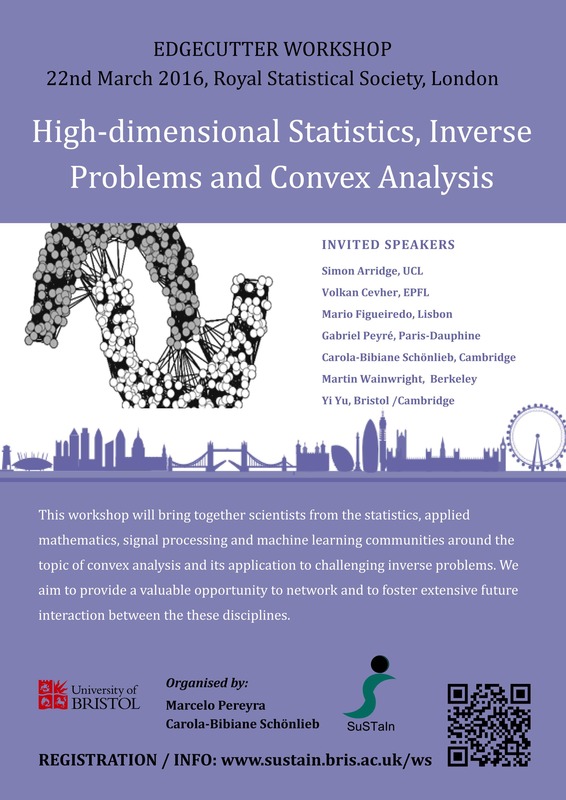 SuSTaIn High-dimensional Statistics, Inverse Problems and Convex Analysis workshop organized by School of Mathematics, University of Bristol, Bristol, BS8 1TW, UK.